In anticipation of the upcoming AQS QuiltWeek® – Spring 2018, AQS and PAA are pleased to host internationally acclaimed “Master of Denim” (Complex magazine) Ian Berry from the United Kingdom on April 8-22, 2018. As an UNESCO Creative City, Paducah, Kentucky is known for connecting cultures, and the American Quilter’s Society (AQS) and Paducah Arts Alliance (PAA) have joined forces to do just that. In anticipation of the upcoming AQS QuiltWeek® – Spring 2018, AQS and PAA are pleased to host internationally acclaimed “Master of Denim” (Complex magazine) Ian Berry from the United Kingdom on April 8-22, 2018. A resident of London, Berry, aka Denimu, was born in Huddersfield, a woolen textile community in West Yorkshire, England. He studied graphic design and advertising at Buckinghamshire Chilterns University College before launching an illustrious creative career that caused him to be dubbed a “Jean-ius” by the UK’s Daily Mail and named him one of the 2013 “Top 30 Artists Under 30 in the World” by Art Business News, the magazine of today’s forward-thinking art professionals. 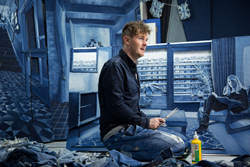 Berry uses ordinary denim to create extraordinary art. At first glance, his work appears to be blue-toned photographs or indigo-colored oil paintings. In reality, they are made of many layers and shades of denim jeans. Berry’s work has been seen across the globe, with a number of sell-out solo shows in London and Sweden; museums and galleries in the United States; and American art fairs, including Art Basel in Miami Beach, Florida, which showcases masters of Modern and contemporary art. In addition to taking photos for portraits and scenes for upcoming work, Berry is slated to interact with art students at Paducah Tilghman High School (PTHS), McCracken County High School (MCHS), and the Paducah School of Art and Design (PSAD). Goodwill and Salvation Army have already donated more than 60 pairs of jeans for student projects, and Berry has arranged for Cone Denim, the historic denim mill in North Carolina, to send a shipment of selvedge denim scraps. “The students enjoy working with denim jeans–something that they are very familiar with as clothing–and turning the denim into an artwork,” said Berry. Under the direction of PTHS art teacher John Romang, students have studied Berry’s process, and each class will share completed denim creations with him on Tuesday, April 10. As a young, male textile artist, Berry wants to attract and inspire young people and help them to open their imagination beyond any preconceived concepts they may have about textile art. He will present a talk at the Paducah School of Art & Design on Thursday, April 12 at 3:30 PM and will be the featured guest at MCHS’s Fine Art Friday on April 13 at 11 AM and 1 PM. As a young British male, Berry sees himself as “not your typical quilt artist.” However, he is excited to be in the arena with today’s quiltmakers and to have his work seen in person by an audience that can appreciate how the tactile qualities of fabric are so much more impressive in real life than they are online. “When I saw the amazing techniques and compositions of quilters, it made my jaw drop. I want my work to do the same for them.” Berry’s installation will be located on the first floor of the Convention Center and will be open with the purchase of show admission on Tuesday, April 17 for the Sneak Preview, 7-9 PM; Wednesday-Friday, April 18-20, 9 AM-6 PM; and Saturday, April 21, 9 AM-4 PM. He will also be presenting a lecture on his work to a sold out audience on Friday, 3 PM, in the Eisenhower Room. To learn more about Ian Berry, visit his website at ianberry.org. For more information or to set up an interview with the artist, contact Rosemarie Steele, Paducah Arts Alliance, 270.331.5588 or Katherine Rupp, AQS Marketing Director, 270.898.7903 ext. 231. The Paducah Arts Alliance (PAA) was established in 2008 with the purpose of providing cross-cultural educational experiences between the Paducah-area arts community and visiting national/international visual/performing artists. PAA initiated an Artist-in-Residence Program with funds provided by the City of Paducah. Since January 2009, PAA has hosted more than 50 visiting American and international artists from 14 states and 7 countries. Over the past five years, resident artists have conducted nearly 60 events, which include workshops, lectures, exhibitions, performances and installations. The Paducah Arts Alliance is a 501c3 organization. For more information on the Paducah Arts Alliance, please visit paducahartsalliance.com. The American Quilter’s Society is the largest quilting membership organization in the world. For close to 35 years, AQS has been the leading voice in quilting inspiration and advice. At AQS, we believe that with the proper resources, the creative individual can take their quilting projects beyond what they can imagine. For more information on the American Quilter’s Society, please visit http://www.americanquilter.com or call 1-270-898-7903.